Tourists are on Twitter Searching for Local Wineries to Visit- Develop a Social Media Presence! Being on Twitter Will Bring Your Winery More Tourist Business! The big week finally arrived, and I packed up and flew to Toronto to meet my boyfriend’s family for the first time. Jason and I are both into wine, so we decided to tour the Niagara wine region for a week after my weekend long familial introduction. Here’s the long story short- the family was great; the wine was great. I didn’t quite know what to expect (from either). I have heard for years that the Ontario wine region is to be respected. My conclusion? It should be. Tourists are on Twitter looking for things to do. Develop a presence, and they will visit you! We wanted to be very choosey about the wineries we visited, and wished to include small boutique wineries, as well as much larger “mass-production” facilities. I will admit in full honestly that the deciding factor for our winery visits and purchases was their Twitter presence. Before our tour, I set about investiga ting area wineries via Google, Facebook, and Twitter. I was delighted to see a few on Twitter, so I set about contacting them. 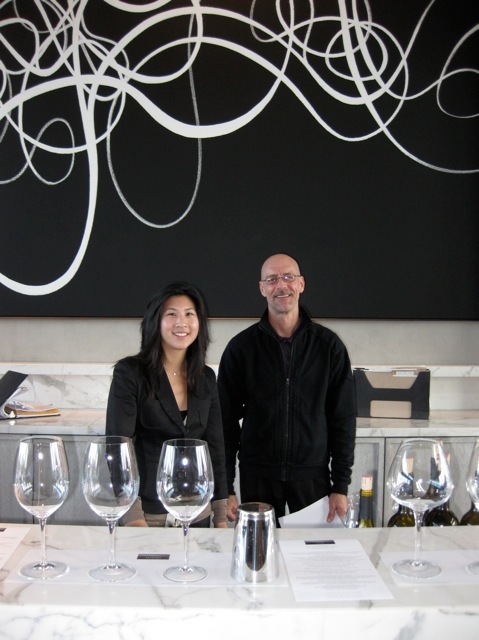 @StratusWines winery Tweeted back to me almost instantly “We welcome you Seattle Wine Gal, come visit us! Ask for Miranda, I will personally run you through our line-up”. Other local wineries were equally as warm. Because of this, these are the wineries that we chose to spend our time and money, and will remember the next time we order the wines that we have grown to love. If you are a winery or business owner, I assure you that it is well worth your while to establish a social media presence to facilitate tourist and local recognition and visitation. I see more and more businesses on Twitter, tweeting about their events to people all over the country. I also know many people who develop their travel itineraries based on these same Tweets (including myself). Thanks so much for the great recommendations @IconWines– you were right on target. Thanks to Miranda for the special attention and amazing tasting at one of the nicest wineries I have ever seen. @StratusWines. Thank you Jackson-Triggs for the amazing quality of your staff- the tour you gave us was excellent (@Casey_Howe). A special thank you to Hugo and Austen.